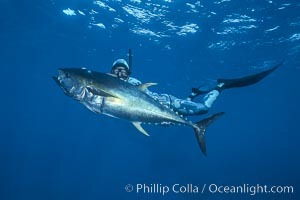 Guadalupe Island is home to the current Pacific bluefin tuna and North American yellowtail spearfishing world records. The only underwater hunting permitted at the island is via breathhold diving using band powered spearguns. These spearfishermen are some of the most skilled and ethical in the world, targeting only fish large enough and of the correct species to warrant taking.